Charlie Sell (center) of Bangor was awarded a plaque for winning his 100th career match in a meet held Saturday. After his pin at 152 last night during the Slaters' 51-23 win over NDGP, Sell's career record at Bangor stands at 101-18. Sell, who is also an outstanding cross country runner, will atend Lehigh next year. Pictured to Sell's right is Scott Heckman who is the career leader at Bangor with 143 wins and is only other Slater to go over the century mark in career wins. (More photos tomorrow) (Another photo below) Sbtt Photo Julie Poliskiewicz. UGI utility work on Route 191 in Roseto will cause lane restriction with flagging today and Thursday from 11:00am to 4:00pm. Between Routes 191 & Main St. will experience lane restrictions and traffic delays between January 14 and January 15 between 9:00am and 2:00pm. Between Stevens Court & Upper Little Creek Road will experience lane restrictions and traffic delays between January 14 and January 16 between 9:00am and 2:00pm. Between Lower Mud Run and Short Road will experience lane restrictions and traffic delays January 12, 13 & 16 between 9:00am and 2:00pm. When the north wind begins to blow I am reminded of the winter meals Grandmom made. One of our family’s favorite in winter was pane cotto [cooked bread]. This meal was very thrifty and satisfying all at the same time. You start with day old good Italian bread. Matt’s 5 cent loaf was the best don’t bother with Amedigan bread, it will disintegrate. Always start with a pot of boiling water, then add salt. Cut your bread and place it in your “skull di macaroon” [colander] into the sink to await its bath. Put the broccoli rabe in the boiling water. In a large frying pan add your favorite olive oil then garlic and sauté until golden. Sometimes Grandmom would also use pancetta, gancuile, bacon or salt pork in this recipe for added richness. Once the broccoli is cooked and strained in the colander, then add and mix in the bread. Serve onto a platter and add the sautéed olive oil and garlic. Ah, what humble substance for a stick to your ribs kind of meal. They also enjoyed making a similar dish called Ciambotto. The same process but the ingredients were potatoes, cabbage, cannellini beans and the bread. As a youngster eating this I would remember having to wait at the dinner table to get up because of the actual weight of the meal. When I finally stood up to leave the table I’d see the smiles and laughter of Grandmom and Grandpop saying, “What is wrong Josie, are you full?” I’d think to myself, “Next time I’ll eat slower.” But next time the same thing would happen because it was so good. Every meal, sitting around the dinner table, I could see that familiar look in their eyes; the look of love, gratitude, pride and happiness of la familia [our family]. "Il problema di mangiare cibo italiano è di 5 o 6 giorni dopo sei affamato." "The trouble with eating Italian food is that 5 or 6 days later you're hungry again." Bingo -Bushkill Fire Co. Doors 5pm. Bingo 7pm. Story Time - Preschool children. Blue Mt. Community Library, Pen Argyl, 10:30am . Open Mic Night - Nazareth Ctr. for the Arts, 7-9pm.
. Are you looking for a gift idea for a book lover or want to add to your book collection? On Friday, Jan. 16 and Sat., Jan. 17, from 10:00 am -12:00 pm, the Blue Mountain Community Library is having an After Christmas Sale in the Book Nook, located on the 2nd floor of the library. Snow dates will be Jan 23 and 24. All items will be reduced for those two days. Please come and purchase gently used Books, CDs, DVDs and Puzzles. A free library tote bag will be given with a $10 purchase. Gift certificates are also available the library is also collecting yarn for the Nazarene Needlers of Bangor. All yarn donations may be dropped off at the library and will be distributed to the group, which makes hand-knitted items for hospitals and nursing homes. The library is located at 216 S. Robinson Ave. in Pen Argyl. Hours are M-Sa, 10:00 am to Noon, and M-Th, 6:00 to 8:00 pm. The Book Discussion Group meets the third Tuesday of each month at 6:30 pm in the library and is open to anyone. The book selection for January 20 is Big Little Lies by Liane Moriarty. 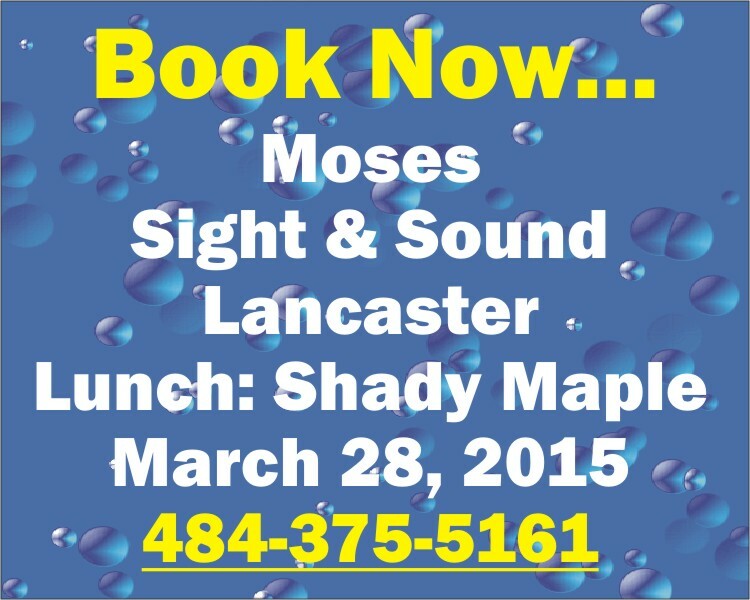 Call Lisa at 610-863-3029 for information. The website is www.bmcl.org. Beginning Friday Jan. 16 through Sunday Jan. 18, 2015 you are encouraging to participate in the 3rd annual "Pay It Forward Weekend". You are asked to do at least one random act of kindness (more than one is even better). It is very easy to participate, All you have to do is something for someone or some organization without expecting anything in return: pay for a stranger’s meal, send someone a card, volunteer some time. The ideas are endless. All it takes is a spark to get a fire going. Find them on Facebook so you can make a difference, and who knows, maybe change someone's life. Get on Board, invite all your Facebook friends to join and let's see if we can change someone's world this weekend. Who knows, it might be your life that gets changed. Last year, we had 484,743 people that accepted the invitation. More remarkable, is that 6,191,963 people saw the invitation and cause. This doesn't count the people outside of Facebook that took part. Remember, it doesn't take people doing a lot, just a lot of people doing a little. The club will hold a fund raiser 6:00pm January 30 at the Legion. January 16th, at 6:30 p.m. Families are invited for fun & fellowship. Bring a favorite game and snack to share. Galen Happel (maroon) of Bangor won the night's opening match with a pin in 1:54 at 138 during the Slaters' 51-23 win over NDGP (More photos tomorrow) (Another photo below) Sbtt Photo Julie Poliskiewicz. (BPT) - When buying a first home, most people are making one of the biggest purchases of their lives. Without home buying experience, it’s hard to separate fact from fiction. Reality: Don’t assume that having a lot of student loan debt automatically disqualifies you from getting a mortgage. The key factor is not necessarily the size of your loan obligation, but the amount of your total monthly debt payments compared to your monthly income. This is called DTI. imortgage, for example, has approved thousands of loans to first-time buyers whose monthly student loan payments were as high as $300, and many more could qualify by increasing their monthly income. Reality: According to TheKnot, the average wedding has 138 guests who typically give a gift valued at $100 each. That’s $13,800 in spatulas, baking pans and other things. If every guest contributed to a Down Payment Fund, you could have enough saved for a down payment on a $276,000 home in San Diego. “These are just a few of the myths about home buying that surface frequently in our conversations with first-time buyers,” says Thompson. “I always advise potential buyers, especially first- time buyers, to get in touch with one of our local imortgage loan officers if they’re interested in straight answers to specific questions about financing a home. We are here to help. An artist is this month attempting to trigger contagious yawning in New York's Times Square. Sebastian Errazuriz has created a video, entitled A Pause in the City That Never Sleeps, consisting of a continuous yawn on loop. It is being on Times Square's electronic billboards from 11:57 pm to midnight each night in January. The yawning character - actually Chilean-born, London-raised, New York-based Mr Errazuriz himself - appears on multiple screens between billboards and advertisements. The artist hopes that, as yawns are contagious, the masses of people looking up at the screens will inadvertently feel inclined to stop and yawn. He said "It's a little scary as an artist to present a project that is this simple... At times the simplest projects are the hardest to do." Tim Tompkins, President of the Times Square Alliance, said, "The beauty of Sebastian Errazuriz's piece is its attempt to induce a contagious moment of calm and pause at the otherwise bustling crossroads of Times Square. "We will see how the largest digital display of yawns in history will affect the city that never sleeps." It may have been almost two weeks since a fire ripped through 26-28 Market Street in Bangor, but community members have not forgotten the fire victims. Brenda O’Bryon, an employee of Merchants Bank, has been working with Jennifer Newland, resident and councilwoman of Roseto, to collect needed items and find housing for the Bangor residents. Brenda even asked her employer, Merchants Bank, for help. “Brenda has such a good heart and has been helping the victims get back on their feet. So when she asked the Bank to help too, we immediately did what we could,” said Anthony Biondi, Chief Executive Officer of Merchants Bank. The bank has opened an account to benefit the fire victims, donated $500.00 to the cause and called upon one of their customers and fellow Slate Belt Residents, Marilyn Rettaliata. She and other members of Ruggiero family will be donating storage space at their B-EB Highway Storage Village. While the community has been generous in donating clothing, furniture and other household goods, until all of the victims find housing, there was no real place to keep the items. More help is needed. Anyone that would like to donate money to the fire victims, can drop payments at any Merchants Bank branch. Checks can be made payable to The Market Street Fire Fund. Items that are still needed include: twin beds, silverware, pots and pans, bake wear, blankets, twin sheets, shower curtain/ rods, toasters, crockpots, hangers, and dressers. To donate items or to volunteer, please contact Jennifer Newland at 610-217-7088 or Brenda O’Bryon at 570-517-6436. Free Adult Education classes of the Bangor, Pen Argyl, and Nazareth Adult Education program will begin the week of January 26, 2015. A Basic Skills refresher class will be held at Pen Argyl and Nazareth High Schools in addition to a GED preparation class. The Basic Skills class will help students improve reading, writing and math skills to then advance into the GED preparation class. Students must attend class both days of the first week for assessment and orientation. If a student is not able to begin January 26, there will be a mid-session start date the week of March 2. The Bangor area GED preparation class will meet in the library of DeFranco Elementary School on Five Points Richmond Rd, Bangor from 6 pm to 8:30 pm on Mondays and Wednesdays. 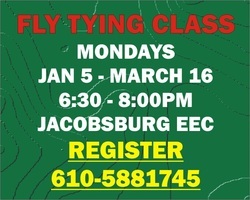 This class begins Monday, Monday January 26. The Nazareth area Basic Skills and GED classes will meet in the lower level of the Nazareth Senior High School Library. The nights for the Nazareth classes are Tuesday and Thursday, from 6 to 8:30 pm, and will begin Tuesday, January 27. Come out and enjoy music by DJ Joe Franzo, and a buffet dinner by Tom Donohue of Pen Argyl Pizza, including baked chicken, macaroni & cheese, salad, vegetable, rolls, coffee, tea, soda and a large variety of home-baked desserts. There will be door prizes, a basket raffle and tricky tray. This is a BYOB event and dress is casual! Music will be followed by karoke – come out to dine, dance and sing, too! Funds raised from this event will be used to help support the free programs that serve the children and families in the Pen Argyl Area School District www.familiesfirstpenargyl.org or like them on Facebook! On Sunday January 25, come to Tractor Supply, Route 209, Brodheadsville from 11- 2,, to meet some of the beautiful loving dogs that Boomer's Angels have for adoption! The Rotary Club of the Slate will be hosting a Beer Tasting Fundraising event to benefit The Rotary Foundation. The Rotary Foundation helps fund needy projects around the world and right here in our Slate Belt Communities. The event will be held on Sunday, January 25th from 4:00 – 7:00 PM at The Scorecard Restaurant, 130 N. Broadway, Wind Gap, PA. The cost is $15.00 with a ticket or advanced reservation and $20.00 at the door. Call The Scorecard or contact any Rotary Club Member to get tickets or make your reservations. There will be 5 beers to be tasted from the Lancaster Brewing Company. Light snacks will also be provided. There will tricky trays, free gifts, and more fun. If you would like to know how you could become involved with Rotary Club of the Slate Belt please join us at one of our weekly meetings to learn how you can help give back to our local communities. We meet every Thursday Night from 6:00 to 7:00 PM at The Scorecard Restaurant in Wind Gap. Rotary of the Slate Belt is a satellite club of West End Rotary. Watch for information on our 3rd Annual Mulligan Bowling Tournament Sunday, March 1st. All proceeds from that event to benefit The Slate Belt YMCA Pool Fund. For more information call The Scorecard or Bill Skinner. The newly formed Wind Gap film club will hold a Chinese Auction fund raiser 6:00pm Friday January 30 at the Wind Gap Legion. at 217 North Broadway, Wind Gap. All are welcome to attend. The auction will include: gift cards from businesses, baskets, baked goods and food, and much more..
A Bangor Vintage Fashion show will be held at Eunikue Fashion at 31 Broadway in Bangor starting at 2:00pm Sunday, January 31. The show will feature vintage clothing worn during different eras in Bangor history, including the 1975 centennial. The event is the first of monthly events planned to commemorate Bangor's 140th year as a borough and in recognition of Bangor's inclusion in the National Historic Register. The public is welcome. Light refreshments will be available. Anyone wanting to provide vintage clothing or model should contact Bonnie LaBar at 610-588-1700 at least one week in advance of the event. Smokin' Outlaw BBQ is takin' it back in time once again - teaming up with The Large Flowerheads… Bringing	you a HUGE all you can eat food spread with delicious smoked meats, homemade sides and sauces, draft beer, soda, coffee, tea and light desserts. Once again, it will be an unforgettable night as The Large Flowerheads play all the classics you remember. So bring your friends, family and neighbors. This year we added a special "Pay It Forward" fundraiser to benefit "Guardians of the Ribbon" and "The Sanctuary at Haafsville". 100% of the procedes from our Huge Chinese Auction and 50/50 Raffles will be donated to them. Food Starts at 4:30 PM - 6:00 PM. DJ style music from 4:00 PM - 7:00 PM	.The Large Flowerheads from 7:00 PM - 10:00 PM. Join everyone at Cross-Road Baptist Church in Bangor from 7-8:30pm to play an array of family board games and don't hesitate to bring your own favorites. ALL AGES WELCOME! Refreshments will be provided. This will be the first Family night at the church. They will be planning one a month for 2015. Portland Movie Night will be held Saturday January 31. Doors open at 2:00pm. Movie starts at 2:30pm. Featured film is Ground Hog Day which will be shown in William Pensyl Social Hall at Portland Fire Company. All ages are welcome, but children under 18 must be accompanied by an a parent or guardian. Munchies will be on sale. No pets. The selections include beef w/wo onions and broccoli-cheese w/wo onions. The cost is $5.50. 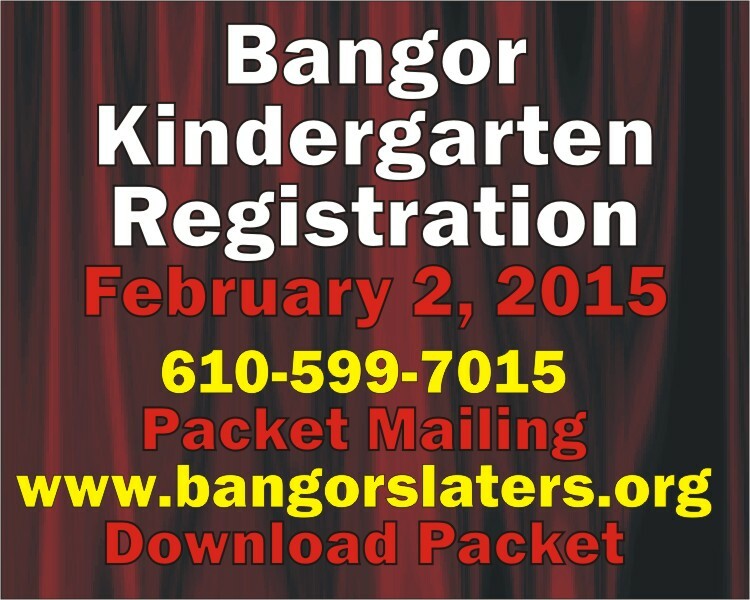 To order, call 610-588-1745 or email loi.stucker@hotmail.com by Sunday, Feb. 1st. Pasties must be picked up at the church on Tuesday, Feb. 3rd, at 3:30 p.m.
A Silent Auction will be held Friday February 6 at Prince of Peace Church in Johnsonville. Doors open at 5:30pm. Bidding begins at 7:00pm. Snow date is February 7. Food will be available. Due to the overwhelming positive response, fun and success of the Cats Hat Flapjack Breakfast for “Suessical: The Musical”, the Bangor Area High School Drama Department will be hosting another pancake breakfast at the Bangor Middle School.. Save the date Saturday, February 7 to have breakfast with the cast of “Hairspray” from 8am-11am. Hairspray is a musical based on the civil rights movement in 1962 and centers around Tracy Turnblad teaching Baltimore about integration after landing a spot on a local TV dance show. Patrons can expect five-star service from the cast. Besides a delicious breakfast of pancakes and sausage all ages can participate in dance lessons to perform, children can play “Hairspray” inspired games, books on the era will be available to read, and families can enjoy performances from the entire cast of “Hairspray”. “Hairspray” items, including tickets to the show, will also be raffled off at the breakfast. The breakfast will raise funds for the high school production. Performances are at 7 pm on March 5 – March 7, with an additional 2 pm matinee on Saturday. Please call 610-599-7011 for further information regarding tickets for the musical. Tickets for the “Hairspray” Pancake Breakfast can be purchased ahead of time by calling Sue Bina at 610-588-3041. Pre-purchased tickets are $5 for ages 6 and up, $3 for children ages 3-5 (children 2 and younger eat free). At the door, ages 6 and up will pay $7 and children ages 3-5 will pay $5. The St. Peter's Annual Oldies Dinner Dance will be held at the Blue Valley Farm Show Saturday February 7 from 6-11 pm. Doors open at 5:00pm. The event is sponsored by the Schloarship Committee of St. Peter's Lutheran Church in Plainfield Township. Tickets are $23. The meal features ham, turkey, filling, veggies and desserts. BYOB. For tickets call 610-588-2101. Music by Steve Anthony. Please bring a non-perishable along and it will be donated to our local food pantries.. Walking Club - 9:30 A.M.
Card Making w/Wanda - Monday January 5 and 26 9:30 A.M.
Zumba Gold - Tuesday's 10:00 A.M.
Crafts & Chat - Tuesday's 9:00 A.M.
Brush away with Senior Artists - Wednesday's 8:00-11:00 A.M.
Christmas Season clean up - Thursday, January 8, 9:30 A.M.
AARP Meeting - Monday, January 12, 1:30 P.M.
MISS JULIE'S SCHOOL OF DANCE, IMMACULATE CONCEPTION SCHOOL AND EAST STROUDSBURG UNIVERSITY Wednesday, January 14, 3:00-4:00 P.M. 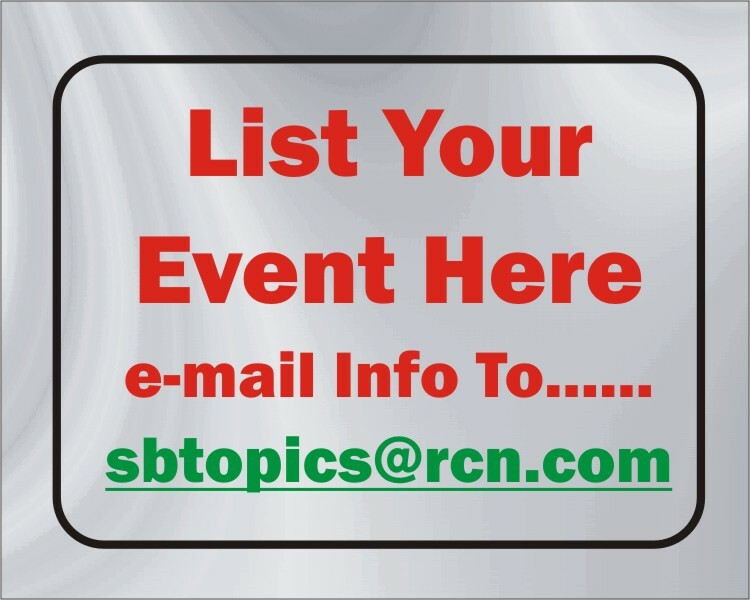 Blood Pressures - Thursday, January 15, 9:00-11:00 A.M.
Council Meeting - Thursday, January 15, 9:30 A.M.
FAMILY FEUD - Friday, January 16, 10:00 A.M. Healthy Eating - Thursday, January 22, 10:00 A.M.
JIM HUMMEL - Thursday, January 22, 12:00-3:00 P.M.
Pictionary - Friday, January 23, 10:00 A.M.
Bean Bags - Wednesday, January 28, 9:30 A.M.
WHO AM I? 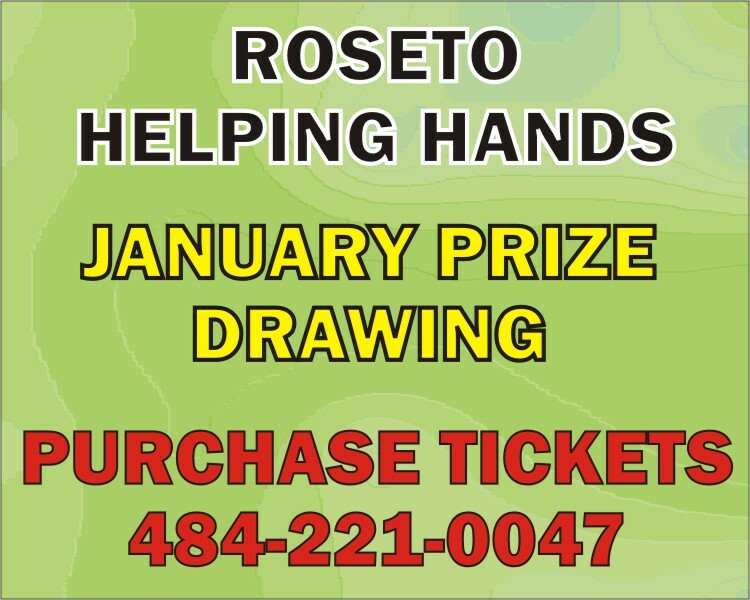 - Thursday, January 29, 10:00 A.M.
January 2015 Roseto Helping Hands will be selling only 100 tickets to win a split prize of $500 between 3 people. Drawing will occur once 100 tickets sold. To purchase a ticket, contact Janet Farole at 484-221-0047.